Playing music in the Big Band genre, 5 saxes, 4 trumpets, 4 trombones piano, bass and drums, for listening and for dancing. 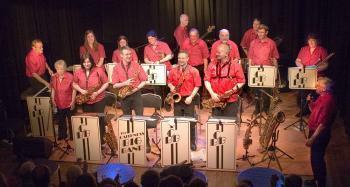 Caithness Big Band encourages participation and tuition in this musical style including improvisation. We welcome invitations to play throughout Caithness and further afield. If booking the band, this should be done well in advance (at least two or three months prior to your event) to ensure the full band is available. The Caithness Big Band will entertain at weddings or corporate events, for which a commercial fee is charged. We also play at community/charity events when a smaller, negotiable charge reflects our basic expenses.